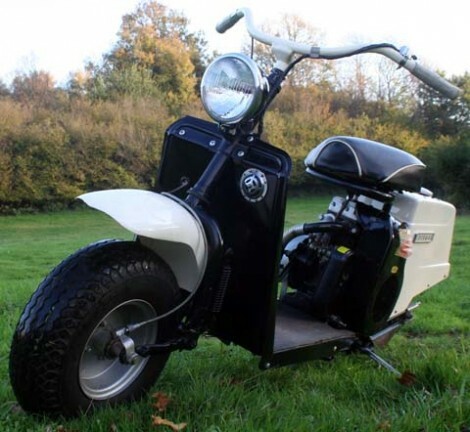 The first Highlander was introduced by Cushman in 1949, as a low-cost basic machine to get kids into the scooter market. The first model sold for $187.50. The 721 Series made its debut in 1958, and was the final Highlander model, as Highlanders were discontinued on 4th August 1964. It’s quite an ‘agricultural’ scooter. The design hardly changed from the 1940s to the 1960s. In nostalgic terms, that certainly provides a lot of charm. But it’s easy to see why Lambrettas and Vespas displaced the hold of American-built scooters when they were eventually imported into the USA and allowed to compete. The engine is quite loud, the ride a little bumpy and, like most old American scooters, they were only fitted with one brake. This is all part of that Cushman charm. America did not suffer the same postwar deprivations as the rest of the world. The forties and fifties were buoyant for vehicle production and public consumption. Scooters were an ideal local transport option for teenagers. The photo below is from 1946.
was once as American as Mom’s apple pie.